Home Economy Is a German Recession Inevitable? The tragedy is that the contraction is being helped along by a deliberate political choice made by Europe’s own governments: Their effort to rein in deficit spending, to cut fiscal stimulus, and to balance their budgets in the 10-year aftermath of the 2008 financial crisis. “Austerity,” as it’s known, has shrunk the potential size of the European economy and retarded its ability to grow again. 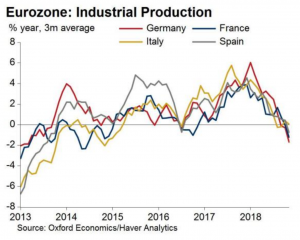 And now that the manufacturing sectors of Italy, France and Germany are all stagnating or shrinking, austerity is hurting their ability to pull out of the dip. That is the conclusion of analysts at both The Institute of International Finance and — in a paper published last week — Oxford Economics. Both independently looked at the difference between actual GDP growth in Europe and “potential” GDP growth, before and after the 2008 recession. In both studies, the analysts concluded that Europe inflicted on itself permanently lower actual GDP growth, following the crisis. “Potential” is the implied trend of GDP growth based on history. When an economy shrinks it can become unable to grow back to its previous size if there is “a permanently lower labour participation rate, a large productivity shock [or] a lower capital stock as both governments and businesses slashed investment spending,” Oxford Economics analyst Rosie Colthorpe says. Since 2008, Europe lost economic activity the equivalent of Spain’s entire GDP, according to Colthorpe. Spain’s GDP is about $1.3 trillion and the country employs about 19 million people, to give you an idea of just how much is “missing.” While it is not directly the case that there would be an extra 19 million jobs in Europe if governments here had been more fiscally supportive, that is nonetheless the scale of the issue we’re talking about. After the 2008 crisis, Europe’s governments feared a consequent debt crisis — a scenario in which the interest payments on their debt spending might be greater than their struggling economies could pay off. Greece did in fact fall into a debt crisis. So they proceeded cautiously on government spending and didn’t cut taxes, to balance government books. EU rules ban government deficits that are greater than 3% of GDP. The result was less money sloshing around in Europe — and lowered economic growth. Financial forecast just a game of chance? One of the more surprising anomalies that went by unnoticed amidst the economic news at the back end of last year was Germany’s revised GDP figures for Q3 in 2018 (that is, GDP growth for the period from July to September). 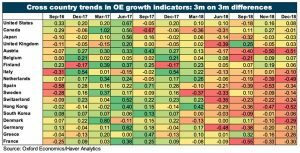 These showed a surprising- 0.2% drop (see fig 1) the first of its kind since the worst effects of the Eurozone crisis were quelled by the start of the European Central Bank’s QE program back in 2015. 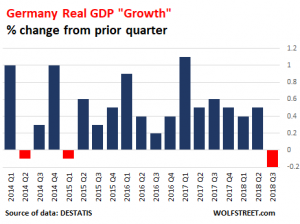 However, this trend has continued into Q4 (October-December 2018) and most business analysts forecast that Germany is now technically in a recession – two consecutive quarters of negative growth. As the second graph on GDP and industrial production (which is the very lifeblood of the German Wirtschaftswunder or ‘economic miracle’) shows the trend over the past two years has been drastically downward. Today this has been met with the further news that output fell by -1.9% in November, pushing the year-over-year rate down to ‘a decade-low of -4.6%’. These figures are very likely to lead to a recession in Germany when the official figures for Q4 are released later this week, which would have a massive knock-on effect on surrounding economies in Italy and France where domestic social discontent is already running high. 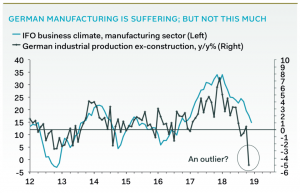 Speaking to Business Insider (09 January) Claus Vistesen of Pantheon Macreconomics stated: ‘Yesterday’s manufacturing data in Germany provided alarming evidence of a much more severe slowdown in the second half of last year than economists had initially expected’. Today, this negative economic news was confirmed with November’s figures. Greece is still struggling to recover from its debt crisis and neighbouring Turkey also dropped into a steep recession, triggered by the devaluation of its currency. The collapse of German industry was so steep and so sudden that Vistesen told clients he almost doesn’t believe the data: ‘The crash in the year-over-year rate is far in excess of anything remotely believable, at least using survey data as a yardstick.’ he told clients. What’s more, the four year ongoing monthly QE program of 40 billion Euros per month that has been fed to struggling European private banks like Allied Irish, Société Générale and Deutsche Bank is due to end permanently in the next month. Next articleTom Watson: Mr Speaker that is not a mere flesh wound. Dr Keith Hussein, specialises in globalisation, culture and media, twenty five years in various FE/HE roles. has an MA and recent PhD (2017). 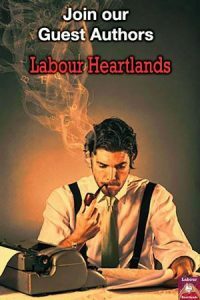 He also writes publications on ethnicity and media.